Did you know that store-bought wheat bread is crossed with wheat that is crossed with Japanese dwarf wheat making it yield high yields but also with higher amounts of starch and gluten and many more chromosomes coding for all sorts of new old proteins? This was done in the 1950’s by PhD plant pathologist Norman Borlaug and he won the Nobel Peace Prize in 1970 and the Medal of Freedom in 1977, and the Congressional Gold Medal in 2006 for his work. He certainly had noble intentions, but for consumers, the results were not toble but unhealthy. It contains the Super Starch amylopectin A that is super fattening. It contains forms of a Super Drug that are super addictive and makes you crave and eat more. Stan Ness of the website Einkorn.com explains the difference between Einkorn (cultivated about 7500 BC) and the 1950’s-60’s dwarf wheat. What gluten studies have found einkorn wheat may be non-toxic to suffers to gluten intolerance. Moden kinds of wheat have 52 chromosomes while einkorn grain has just 14 (friendlier to the body’s digestive system). Einkorn contains 3 to 4 times more beta-carotene than modern wheats (boosts immunity, helps prevent cancer and heart disease). Einkorn contains 2 times more Vitamin A (retinol equivalent) than modern wheats (healthy eyes, reproductive organs, and prevention of many cancers). Einkorn contains 3 to 4 times more lutein than modern wheats. 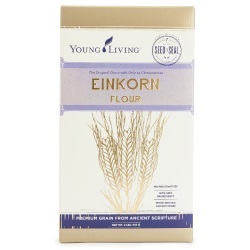 Einkorn contains 4-5 times more riboflavin than modern wheats (used by the body to create energy and is an antioxidant). This entry was posted in Healthy Foods and tagged better than wheat bread, Einkorn bread, Einkorn flour, gluten free bread, healthy bread, Young Living. Bookmark the permalink.